The prevalence of smoking amongst Māori communities is higher than the norm and the same is true of Māori nurses. Smokefree Nurses have a Māori Strategy Leader who, in conjunction with colleagues and advisors, has been working on developing strategies to address this imbalance. 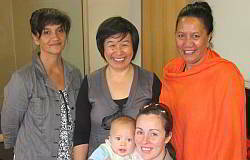 Smokefree Nurses' Māori Strategy was presented at Te Runanga's research day in December 2010. The strategy has been written collaboratively by Evelyn Hikuroa (Nurse lecturer, MIT; back left) Angilla Perawiti (Te Ha o Te Oranga o Ngati Whatua; back right) and Jeanine Tamati-Eliffe (TORU Consultancy; front). Grace Wong (Director, Smokefree Nurses) is back centre. Māori Strategy reflects the desire of Māori nurses to support quitting amongst their colleagues and to support Tupeka Kore Aotearoa. The Māori Strategy flowchart can be found here. Beyond the ABC: this document designed to help tailor strategies to stop smoking to high-risk groups. It includes information and evidence on supporting smokers who are mental health service users to stop smoking.